I’m pleased to announce that we have raised $10,814.10 toward our $12,000 fundraising goal, and that the new tote arrived from the printer on Friday. THANK YOU to the 177 readers who have made generous contributions already. 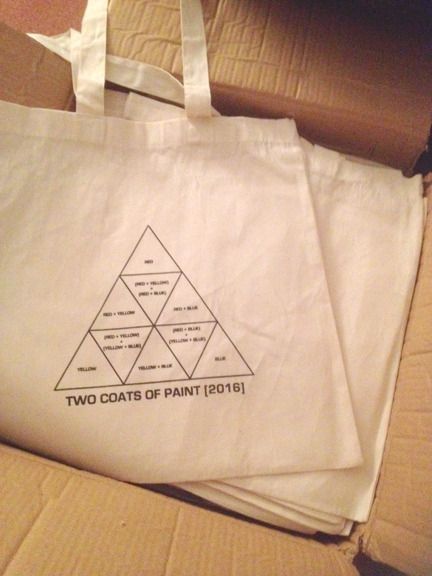 To those who have not yet contributed (please donate here), keep in mind that no contribution is “too small,” and that contributions of $100 or more will get you a 2016 Two Coats of Paint cotton tote that features Goethe’s color triangle. Sweet. The more contributions we get, the more posts we can produce in 2016. Check out our Google Funding Map here. Learn more about the Two Coats of Paint fundraising campaign (and thank you gifts) here. Thank you for supporting independent art writing.